Purpose: To evaluate the sensitivity and specificity of Nassar color discrimination test in the presence of diabetic macular edema (DME) as a sensitive diagnostic tool for the detection of early functional changes. Design: A prospective, comparative case–control study. Setting: Multicenter study in the outpatient clinic of Beni Suef University, Fayoum University, and Misr University for Science and Technology. Methods: The study included 120 eyes with Type I diabetes recruited from the outpatient clinic. All patients were received ophthalmic exams and tested with Nassar color plate test, fluorescein fundus angiography (FFA), and optical coherence tomography (OCT). The main outcome measures are the presence of mild or moderate tritans indicating early DME changes that were documented in each group. Statistical Analysis Used: Student's t-test and ANOVA f-test were used for statistical analysis. P <0.05 were considered statistically significant. Results: The mean age of the patients was 41.15 ± 5.61 years (range 23–49 years) with the mean disease duration of 13.56 ± 2.59 years (range 10–20 years). 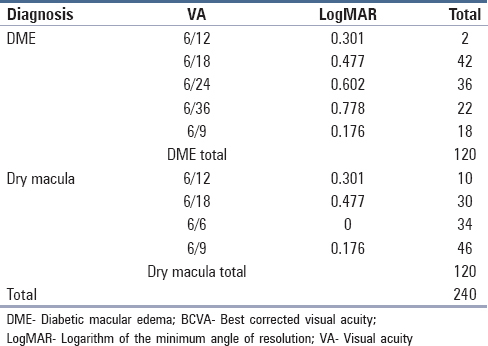 All patient with dry macula (n = 60, 50%) were normal on Nassar color test while patients with DME showed normal (n = 6, 5%), mild tritan (n = 14, 11.66%), and moderate tritan (n = 40, 33.33%), respectively. Hence, the Nassar color test is 90% sensitive and 100% specific. Conclusions: The Nassar color plate is an affordable and effective for early detection of DME and recommended to be used in all primary ophthalmic examination especially in areas where no access to comprehensive ophthalmic exams such as OCT and FFA. 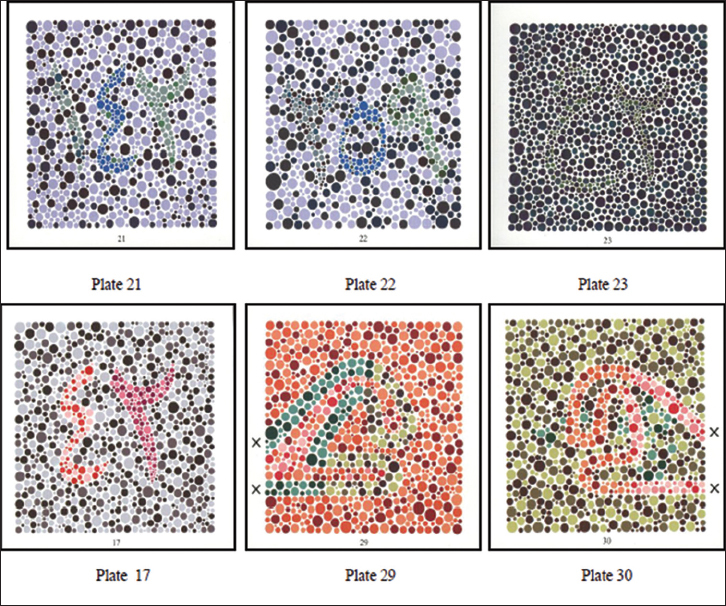 Color blindness or color vision deficiency is the decreased ability to perceive differences between some of the colors that others can distinguish, it may be inherited or acquired and can be diagnosed by color vision tests such as ishihara, franthworth D D-15 test, and Nassar color plates. The anatomical study has demonstrated that the center of the fovea appears to be devoid of S-cones in primates., Foveal tritanopia region extent is about 20–25 min of arc. Although there are lots of new modalities for treatment of diabetic retinopathy (DR), still many patients lose their vision. It is important to detect DR and preproliferative DR as early as possible to improve patient's vision and lifestyle. Early detection should be done before serious damage has occurred as rarely vision may improve especially after laser treatment. with the rising incidence of diabetes constant active screening should be done thoroughly with an effective cheap method like using the Nassar color plates. This study aims to evaluate the sensitivity and specificity of Nassar color discrimination test with the presence of macular edema in patients with diabetes mellitus as a sensitive diagnostic tool for the detection of early functional changes. The ethic committee approved the study protocol, and informed consent was signed by all the patients in the study. The study included 120 eyes with Type I diabetes recruited from the outpatient clinic in Beni Suef University, Fayoum University, and MUST University Hospitals. Patients are younger than 50 years of age. Patients with chorioretinal scars in the macula were also excluded. Full history taking and considering the age of the patient, type, and duration of diabetes as well as a mode of diabetes control. The family history of diabetes mellitus, history of known ocular diseases, and history of other medical diseases were recorded. Snellen chart was used to measure visual acuity (VA) both uncorrected (UNCV) and best-corrected visual acuity (BCVA) then Nassar Color plate test followed by complete ophthalmological examination of anterior segment to detect any opacities or rubiosis iridis by slit lamp, tonometry using applanation tonometer, then tropicamide 1% for pupil dilatation thorough slit lamp biomicroscopy to detect of retinopathy stage, macular edema, any other vascular retinal diseases, any degenerative retinal diseases or optic disc abnormalities such as glaucomatous cupping, NVD, hemorrhage, or papilledema. Fundus fluorescein angiography and optical coherence tomography (OCT) were done to all patients. All patients were screened using Nassar color plates. Thirty-two plates were designed to be tested in daylight or at least as close as possible to it. Plates contain Arabic numbers and letters, algebraic diagrams, figures, and lines to be traced by figure [Figure 1] and [Figure 2]. The plates are held 75 cm from the subject and at a right angle to the line of vision. The answer should be given within 3 s and figures to be traced within 10 s. Plates 21–24: Test blue: Yellow color sense. European grading protocol  was used in our study for DR grading. Eyes classified as preproliferative DR, proliferative DR, or maculopathy were considered a sight-threatening DR (STDR). While eyes with no DR or background DR considered as nonsight threatening DR (NSTDR). The presence of mild or moderate tritan indicating early diabetic macular edema (DME) changes was documented in each group. Student's t-test and ANOVA f-test were used for statistical analysis. P <0.05 were considered statistically significant. All patient data were collected in a Microsoft 2007 Excel Sheet (Microsoft, USA) and analyzed using SPSS ver. 16 software (IBM, USA). This study included 120 patients recruited from the ophthalmology outpatient clinic in Beni Suef University Hospital, Fayoum University, and MUST University with Type I diabetes. Patients will be classified into the following groups: Group 1 with DME and Group 2 without DME. All patients were subjected to fundus fluorescein angiography, OCT, and Nassar color plates. The 120 patients seen were with Type I diabetes. The average age was 41.15 ± 5.61 years (from 23 to 49 years) with an average duration of 13.56 ± 2.59 years (from 10 to 20 years). [Table 1] summarizes the details of demographic data of the patients. The VA measurements and analysis was summarized in [Table 2]. The details of Nassar color plate's outcome are listed in [Table 3]. 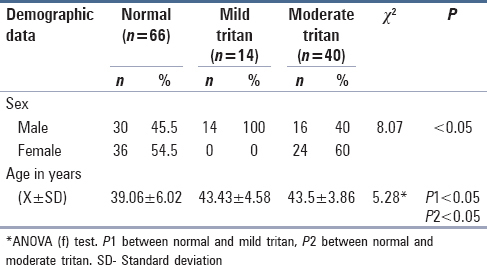 The prevalence of mild tritan by NASSAR color plate is significantly higher among male patients while moderate tritans were significantly higher among females (P < 0.05) as shown in [Table 4]. The mean age of normal patient by Nassar plate is significantly lower than mild and moderate tritan (P < 0.05) as shown in [Table 4]. The mean duration of DM among moderate tritan by Nassar color plate is significantly higher than normal tritan patients (P < 0.05) as shown in [Table 5]. The percentage of BCVA at 6/6 and 6/9 is significantly higher among normal patients by Nassar color plate (P < 0.05) while percentage of BCVA at 6/24 and 6/36 is significantly higher among moderate tritan by Nassar color plate (P < 0.05) as shown in [Table 6]. The validity of Nassar color plates in relation to fluorescein angiography in diagnosing cases of DME are shown in [Table 7]. Significant correlations have been shown between DR and deficits in color vision demonstrated by many color vision tests such as FM100 and RGB anomaloscope. However, some of these tests as in Farnsworth-Lanthony D-15 and FM 100 hue are not sensitive enough, thus inadequate for screening especially on widespread patient examination. Green et al. in 1985 declared FM 100 hue as inadequate for severe retinopathy detection as it showed only 66% specificity and 73% sensitivity. Bresnick et al. showed less results in only 59% specificity and 65% sensitivity and concluded that FM 100 hue is a troublesome test to be done as a screening measure. Mollon-Reffin “Minimalist” test was used by Maár et al. were they detected macular edema in diabetic patients with 88.9% sensitivity and 93.3% specificity. In our study, we use the Nassar color plate with sensitivity, specificity, and accuracy at 90%, 100%, and 95%, respectively, in detecting DME. Cost should be balanced with the kind of test done for the detection of diseases to ensure economically viable screening programs. In our study, the cost was cheap, and we can detect early cases of DME without the use of expensive investigative examinations as compared to Shin et al. in 2014 who used computerized color vision test for detection of DME with an OCT and reach a conclusion that the observed correlation between Seoul National University computerized color vision test (SNU) error scores and foveal thickness indicates that the SNU test may be useful for detection and monitoring of DME. The Nassar color plate is a cheap and effective test to early detect macular edema and recommends to be used in all ophthalmic primary examination in Arabic countries especially in areas far away from OCT and fluorescein fundus angiography. DeMonasterio FM, Schein SJ, McCrane EP. Staining of blue-sensitive cones of the macaque retina by a fluorescent dye. Science 1981;213:1278-81.
de Monasterio FM, McCrane EP, Newlander JK, Schein SJ. Density profile of blue-sensitive cones along the horizontal meridian of macaque retina. Invest Ophthalmol Vis Sci 1985;26:289-302. Davies N, Morland A. Extent of foveal tritanopia in diabetes mellitus. Br J Ophthalmol 2003;87:742-6. Foulds WS, McCuish A, Barrie T, Green F, Scobie IN, Ghafour IM, et al. Diabetic retinopathy in the West of Scotland: Its detection and prevalence, and the cost-effectiveness of a proposed screening programme. Health Bull (Edinb) 1983;41:318-26. Ong GL, Ripley LG, Newsom RS, Casswell AG. Assessment of colour vision as a screening test for sight threatening diabetic retinopathy before loss of vision. Br J Ophthalmol 2003;87:747-52. Kohner EM, Porta M. Protocols for screening and treatment of diabetic retinopathy in Europe. Eur J Ophthalmol 1991;1:45-54. Green FD, Ghafour IM, Allan D, Barrie T, McClure E, Foulds WS. Colour vision of diabetics. Br J Ophthalmol 1985;69:533-6. Bresnick GH, Condit RS, Palta M, Korth K, Groo A, Syrjala S. Association of hue discrimination loss and diabetic retinopathy. Arch Ophthalmol 1985;103:1317-24. Maár N, Tittl M, Stur M, Zajic B, Reitner A. A new colour vision arrangement test to detect functional changes in diabetic macular oedema. Br J Ophthalmol 2001;85:47-51. Shin YJ, Park KH, Hwang JM, Wee WR, Lee JH, Lee IB, et al. 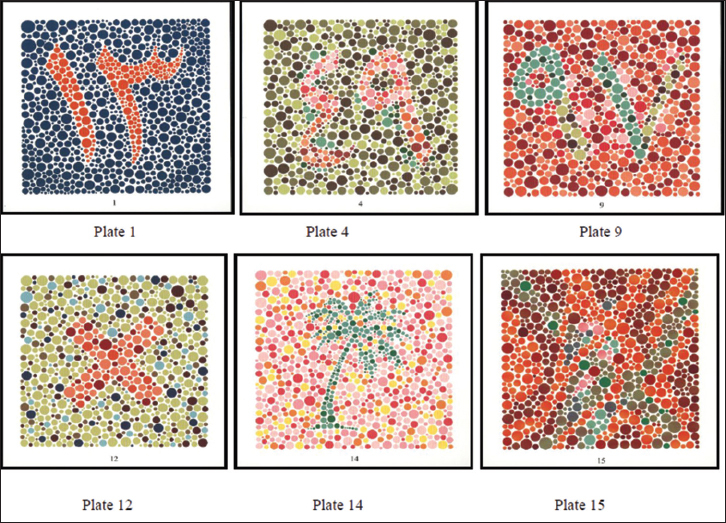 A novel color vision test for detection of diabetic macular edema. Invest Ophthalmol Vis Sci 2014;55:25-32.